I was just updating my portfolio website, and I decided to create a visualization from the summaries of my conference presentations for the year. I gave nine presentations last year. I travelled across three of the four main islands of Japan, Okinawa, Korea, and I even spent some time in France. It was a busy and exciting schedule. 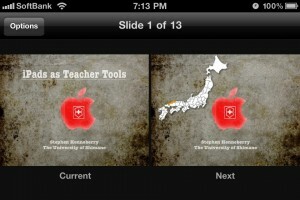 My plans for 2012 are not as exciting, but I have already presented in Hiroshima and Nishinomiya in the past two months. 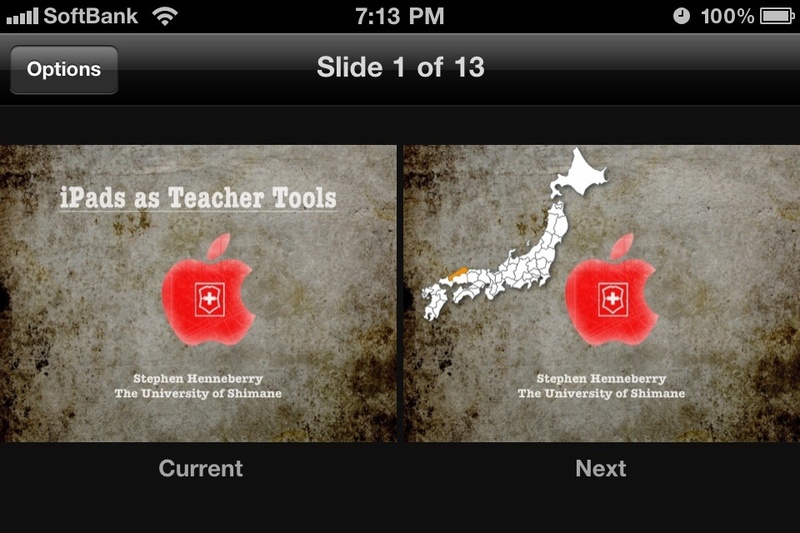 I have a few more conferences scheduled in Japan, and even a trip to a conference in Russia on the books for November. I am looking forward to another rewarding year of academic presentations and discussions. While this is not really an EdTech lesson, I thought that I would share this lesson here nonetheless. While there are some great solutions out there, such as Moodle Reader, I have always shied away from quizzing students on their ‘pleasure reading’, as I did not want to taint the practice with the idea of assessment. Of course, there must be some accountability, but I have always tried to allow the students to demonstrate their progress in ways that involved sharing and creativity. This is why my central ‘assessment’ of our SSR program is Book Group Day. It is an activity that I often squeeze in between units in a textbook to give the students a change of pace. 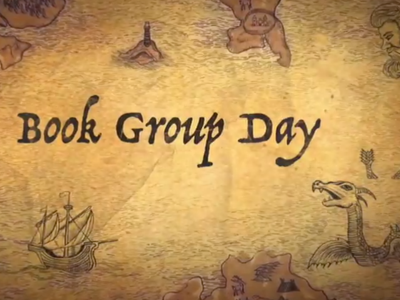 Book Group Day is an activity which is completely student-centered, and facilitates the discussion and sharing of ER books. Would you recommend this book to a friend? Why? Why not? 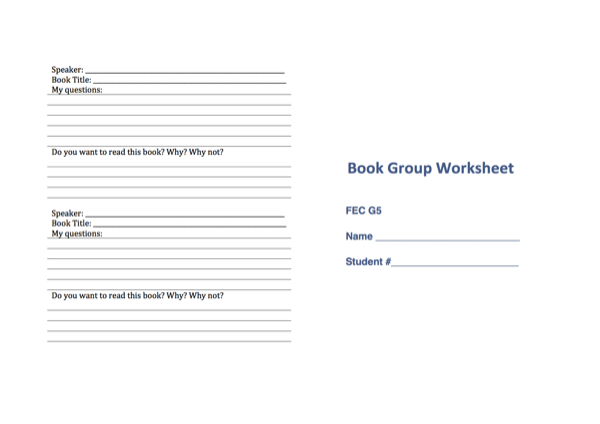 Once the students understand the booklet, and the expectations of their group discussions, they work in groups on the task of thinking of questions to ask about books. The students work together to create a list of questions, which are then shared with the class while the teacher types them into a text file projected on a large screen. ~ I had to sneak some EdTech in there. This was done on my iPad 2, using my Zagg bluetooth keyboard. ;^) The use of the large screen allows students to see which questions have already been shared, which helps to prevent duplication. The list of questions was later parsed, categorized and printed as a booklet on B5 paper to be given to students on Book Group Day. On the day of the lesson the students were immediately put into groups and given their Book Group Day Questions booklets. 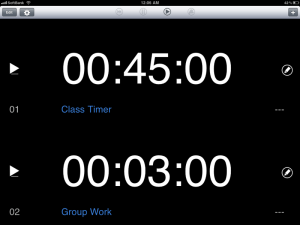 The students were given a task time limit of 40 minutes, and the teacher posted a digital timer on the classroom screen to keep students on pace. They were given about ten minutes per book, but offered flexibility to account for differences in plot complexity and levels of interest. The students started each ’round’ by introducing their books to the group. Once the student had finished introducing the book, each of the other students were to take turns asking questions about the book. This is where the Book Group Day Questions booklet came in handy. The students were each expected to ask two questions about each book, and to take notes on both the questions they asked and the responses. Additionally, they were tasked with answering a question about whether they would like to read the book discussed. While not all students remained focused and on task, the lesson generally goes well. The students demonstrate comprehension of the books which they read by summarizing them for their peers, they share opinions about their books, the plot, and the characters, and they learn about interesting books from others. This is a great activity for taking the primarily receptive task of reading, and making it a four-skills activity. 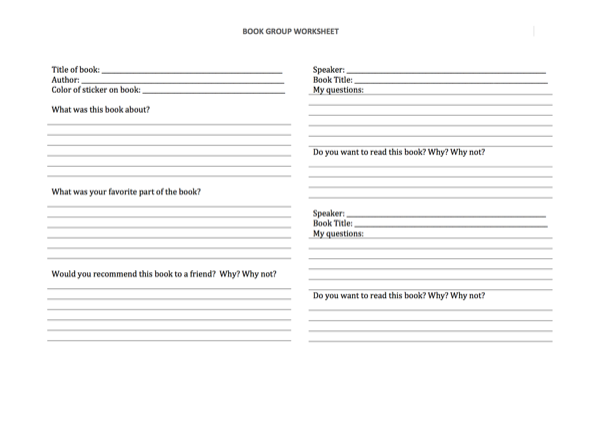 Reading: Students must read a book to complete the Book Group Day booklet. Writing: Students must write short summaries and ideas about the book. Listening: Students ask questions about each book, so they must listen to prepare their questions. What do you think? Is there room for Book Group Day in your course? 90 minutes later I had a pile of blog posts to sift through, and over breakfast I planned my day using their suggestions. I used my camera and my iPhone to document the day, and the following video is the result. 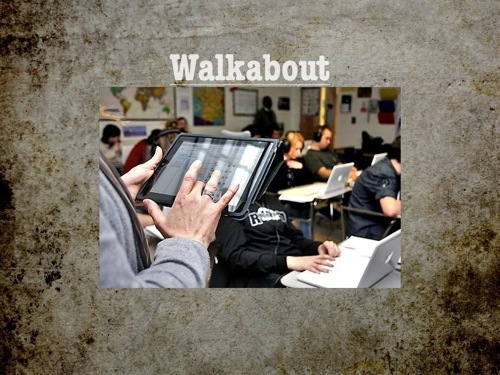 If teachers must travel for conferences, why not involve the students? Why not give them an opportunity to share in the experience? My students often pester me for souvenirs from my trips, but there is simply no way that I can bring back gifts for all of them. Why not allow them to take part in your travels instead? How else could you involve your students in your conference travels? 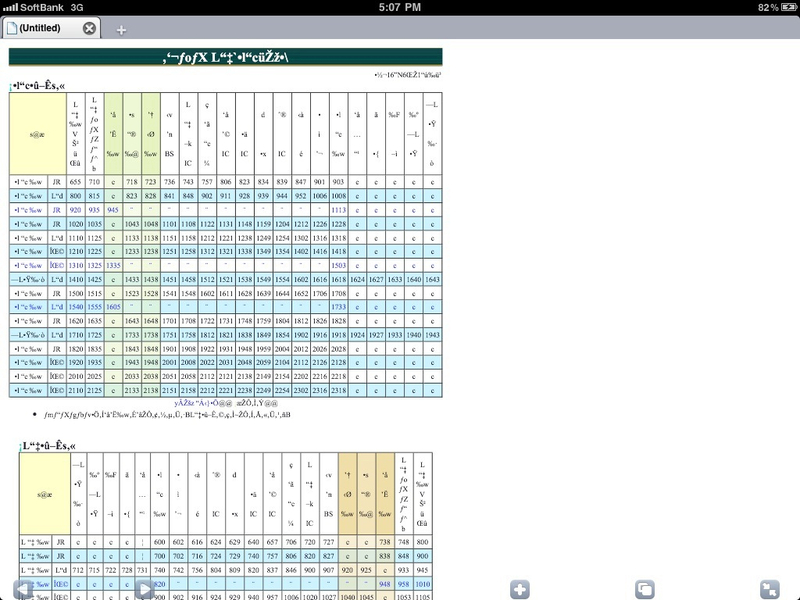 I am sitting on the Shinkansen from Kurume to Hiroshima, and I just discovered that the web site with the bus schedule for the last leg of my return home has an encoding issue on the iPad. 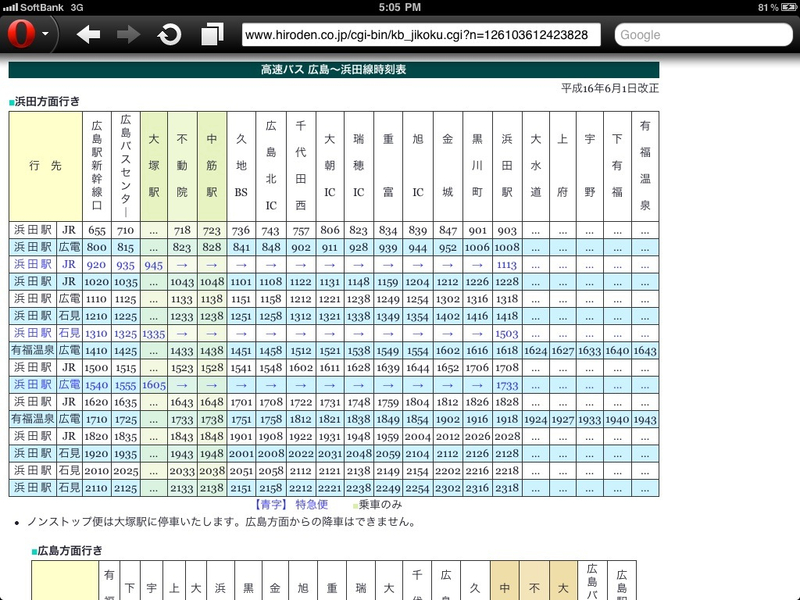 I tried to visit the site to find out when the next bus is, but all the text was garbled. Luckily, I don’t give in easily. I have more than a handful of browsers on the iPad, so it was just a matter of time before I found one that would work. 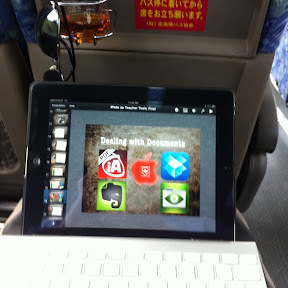 I am polishing up one of my presentations for JALT-CALL this weekend while traversing the Chugoku mountains by bus. 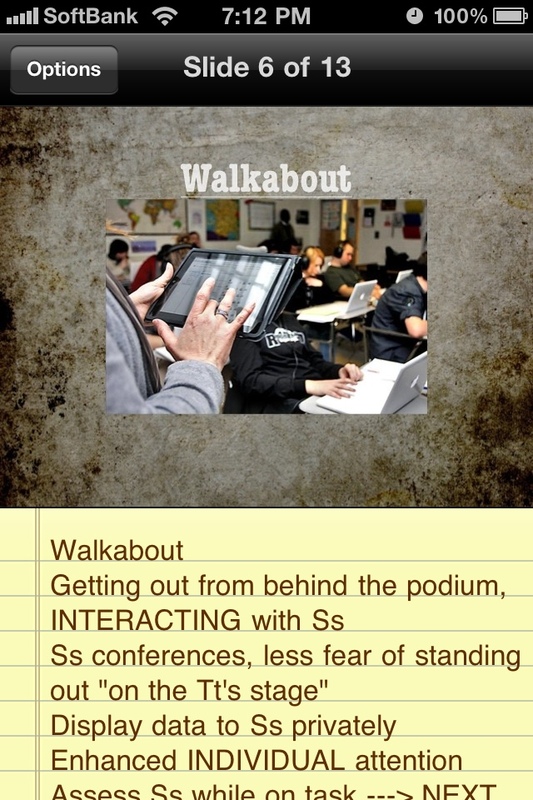 One of the things I love most about using an iPad in the classroom is that in unchains me from the “PC on the podium” model of using technology in the classroom. I like to be mobile while teaching, so the ability to carry the device with me is central to its value in the classroom. That said, I have also taken to using the iPad to completely replace my laptop in the classroom, so it is often used for giving Keynote presentations. 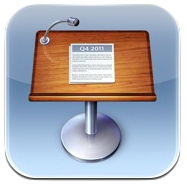 The thing that always bothered me about this was the absence of a remote control for Keynote on the iPad. This “mobile device” was now changing my presentation practice, as I found myself stuck at the podium using the touch screen to advance the slides. No more. 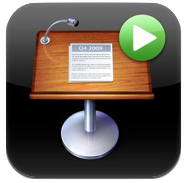 Apple updated their iWork apps for iOS today, and one of the most exciting improvements to me is the ability to use Apples Keynote Remote iPhone app ($0.99 in USA store/ ￥115 in Japan store) to control your iPad presentations. I tried it out in class today, and it works perfectly. The connection is via WiFi, while Bluetooth is also available for back-up, and the response is quite good. 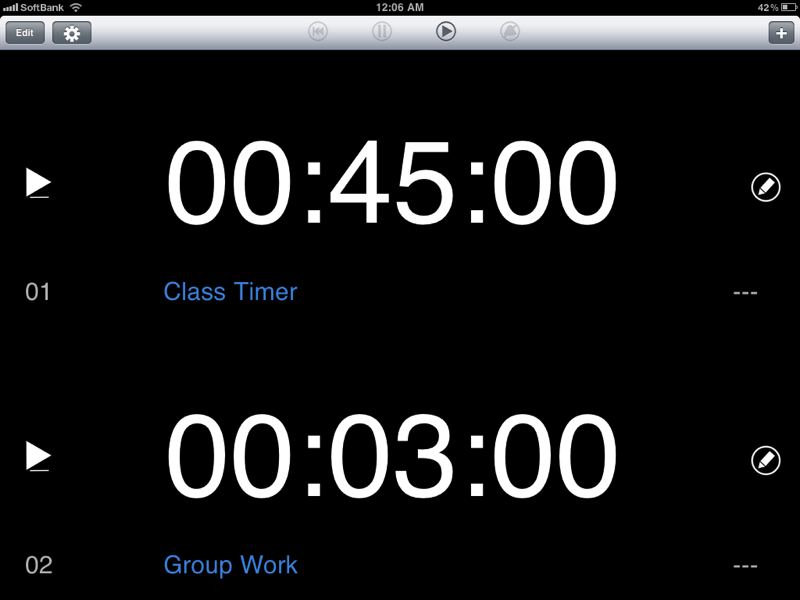 Control your iPad Keynote presentation with your iPhone or iPod Touch. 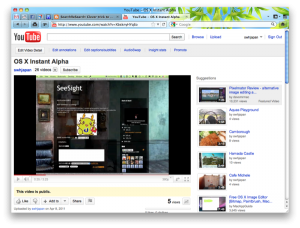 The interface is actually quite nice. You have the option between using the iPhone in Portrait or Landscape mode when using it as a remote. 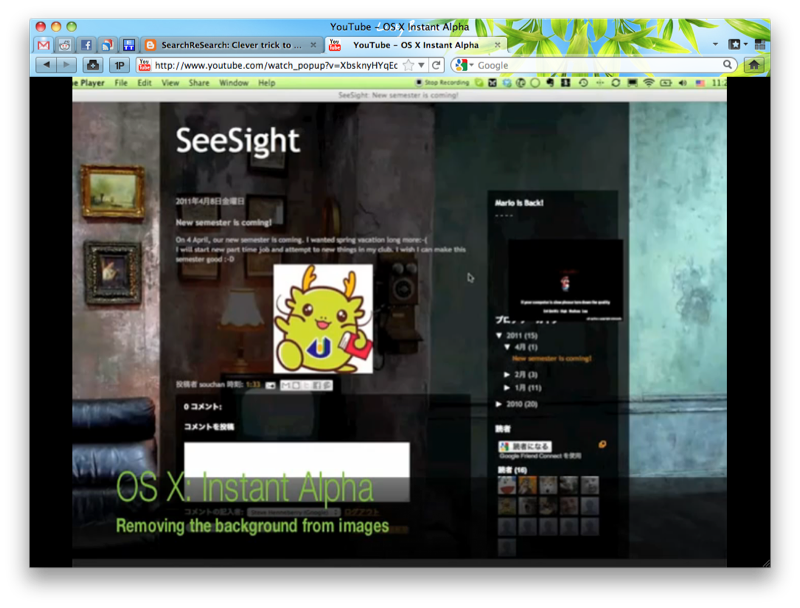 Landscape mode will give you a view of your two slides, or slide builds, at a time. The downside of this layout is that it will take two hands to work the iPhone, and there are no speaker notes on display. I could see this being useful if you were to present from a podium, while your iPad was off-stage, but I can’t see using this in the standard classroom. The loss of access to the speaker’s notes is also a negative point, as it is nice to have those in hand, so to speak. Although I have never used a remote with a built-in “cheat sheet” before, I am looking forward to trying it out this weekend at JALT-CALL in Kurume. Add to this set-up the Chronology timer running in the background on the iPhone, with the timer alerts set to vibrate, and you have a nice little presentation device. What do you think? Not bad for $0.99. Tonight I adapted my site for the iPhone (or other smart phones) with a simple plugin addition to my WordPress installation. On the left you can see the “Before” image, and on the left the “After”. 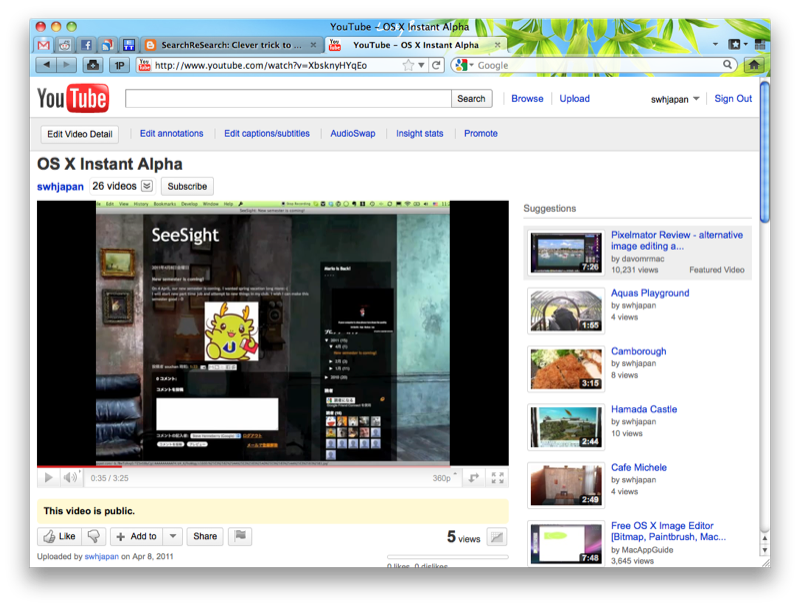 The plugin, WPtouch is simple to install, and there are quite a few settings which allow for personalization. The plugin comes with a collection of icons, such as the calendar icons used for posts in the images to the right, and you can even upload custom images to match your blog. 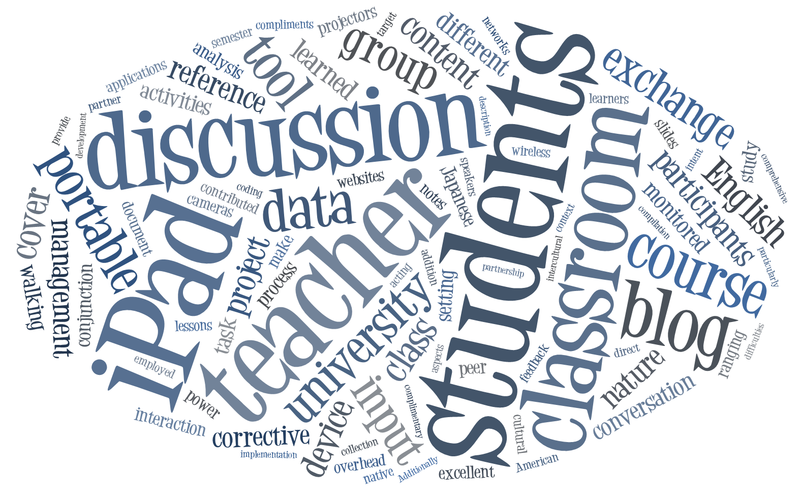 I took a quick click over to Wordle.net to create the icon used for this site. I am sure that I will tweak that a bit in the future, but it was good to test the concept. In addition to adapting your site to work well with handheld screens, the plugin also allows users to create a desktop “App” link to your site. This is where the icon I created using Wordle comes into play. 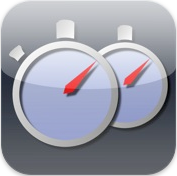 Readers can click the bookmark link in Safari on the iPhone and choose to “Add to Home Screen”. An App link, using your custom icon, is then added to the reader’s smart phone desktop. If you click that link, you will see the video in the middle of the page and it will be surrounded by other images and text (see right). 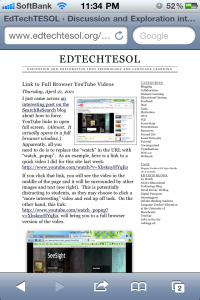 This is potentially distracting to students, as they may choose to click a “more interesting” video and end up off task. On the other hand, this link: http://www.youtube.com/watch_popup?v=XbsknyHYqEo, will bring you to a full browser version of the video. This is obviously something that would be useful in education, as you can help to reduce distraction. 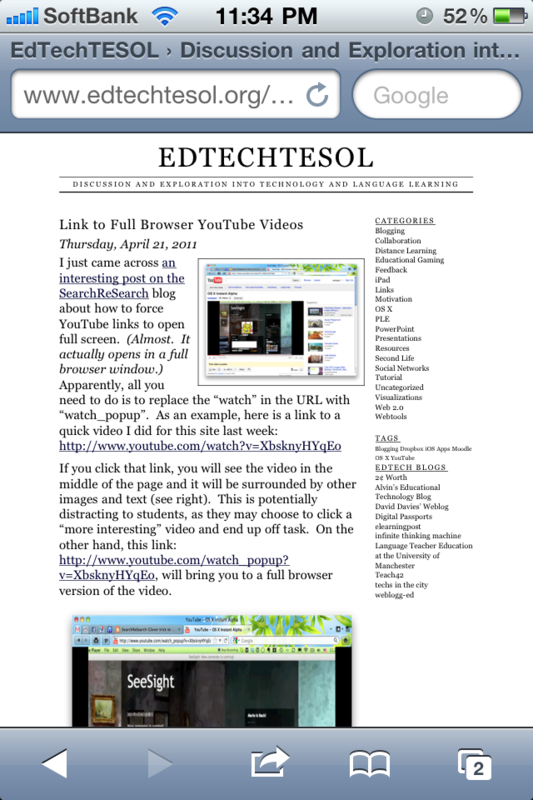 I generally use embedding to add YouTube videos to my blog posts and Moodle courses, but I can see where this would be useful. What do you think, interesting trick? 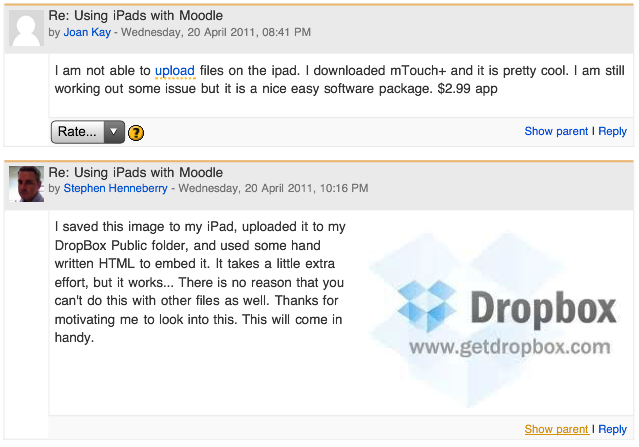 I have been using my iPad with Moodle quite a while now, and like many others I have been frustrated by the inability to upload files. 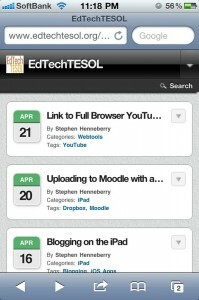 A recent update to the Dropbox app for iPad gave me an idea, so I tried it out today on the Moodle.org forums. It seems that Dropbox can be used as a nice work-around to resolve this issue. 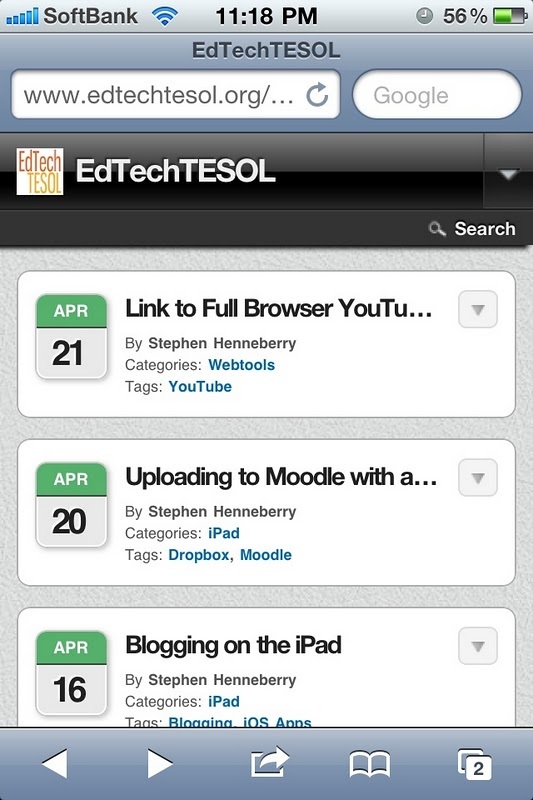 img src="LINK TO IMAGE FILE.jpg" alt=""
As much as I love using my iPad to interact with Moodle, it will never become my only interface with the Moodle sites I work with. I don’t think that many others will use their iPads as such a device either, as most people will use their desktop and/or laptop for the heavy lifting. The iPad is only for the time sensitive (read on-the-fly) changes to your Moodle course, so this Dropbox method works for me just fine. Find an image online which you want to upload to your Moodle course. 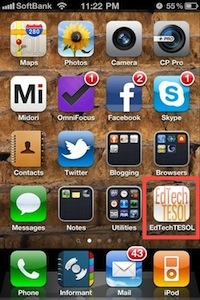 Touch the image to get the pop-up menu and save it to your iPad. 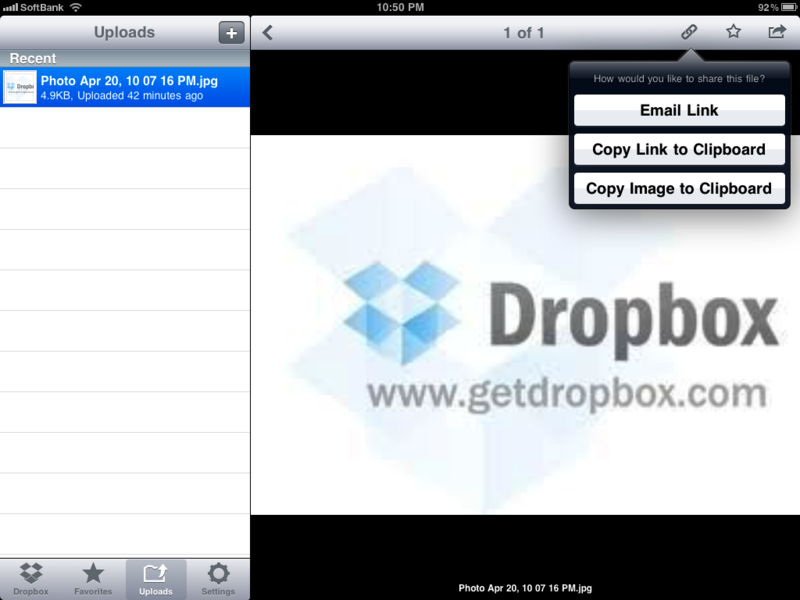 Open Dropbox, and use the Upload icon to choose the image from your iPad’s library. 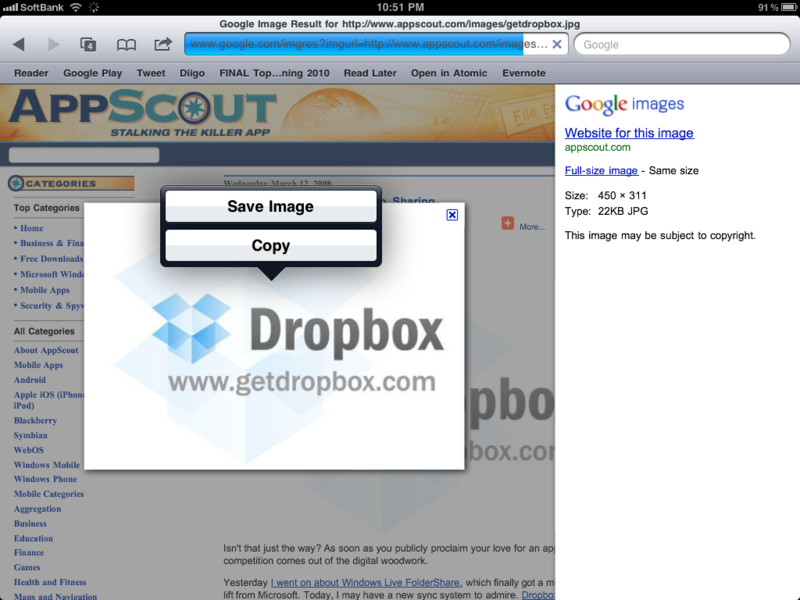 Click the “link” icon and copy the public URL to the iPad’s clipboard. Now you just need to use the IMG code above to insert it into your Moodle post.